FltCtrl - Flight Control: Flight operations simplified. Complete solution to flight operations. 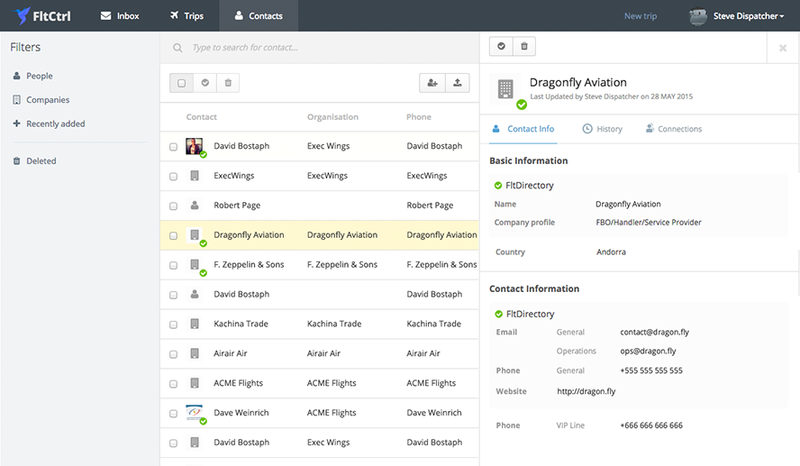 FlightControl streamlines flight operations by combining the essential features of different tools your team would usually use into a single interface and adding extra functionality on top of it. 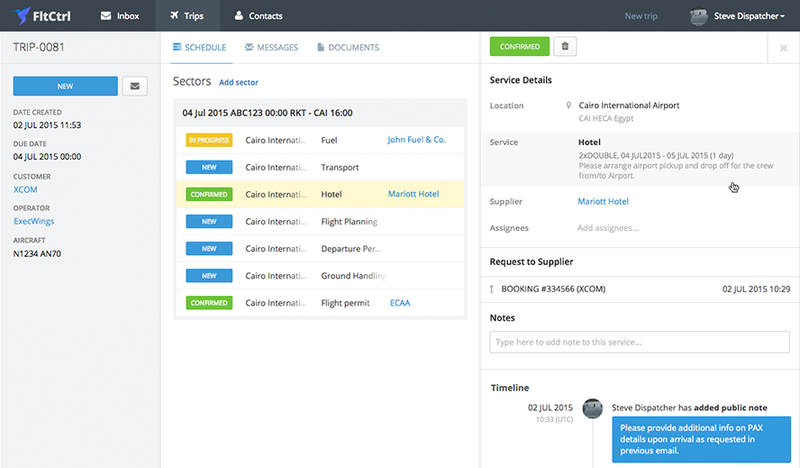 Everyone in your team will have their work streamlined and all of their correspondence organized with the flight request concerned. A unified system storing all data in one place. Flight data are entered once into FltCtrl using pre-set templates; saving the organization’s staff ton of data entry, precious time and resources while executing their tasks. Prioritize your operation tasks so that you can accomplish more in less time. Help you keep an eye on the progress of your team thus making sure you meet your deadlines. At the core of FltCtrl, lies the ability to configure email dropbox to track and manage emails in a central location to meet your organization’s specific requirements. No more messy email threads: Instead of scattering and exchanging endless amount of emails to accomplish any given task, FltCtrl uses state of the art technology to keep communications in one centralized location viewed by only those given access accordingly. FltCtrl up-to-the-minute updates on tasks help keep both your team and clients informed and as to the status of their flight requests. With contacts details in a central location – you can see who, what and when things are needed with a click of a button. This, in turn, will help you organize your work and limit the time being wasted in looking up updated contacts of your suppliers and customer when they are needed the most. Keep track on what customers have to say. Don’t send your team searching for correct contacts - FltCtrl will help keep your information updated. With FltCtrl everything about your contacts is clear, simple, easy and within reach. View a list of active, completed and overdue milestones. Further assignment and tracking of tasks is effortless with FltCtrl optimized centralized location where due dates and who is tasked with completing said tasks are simultaneously updated. 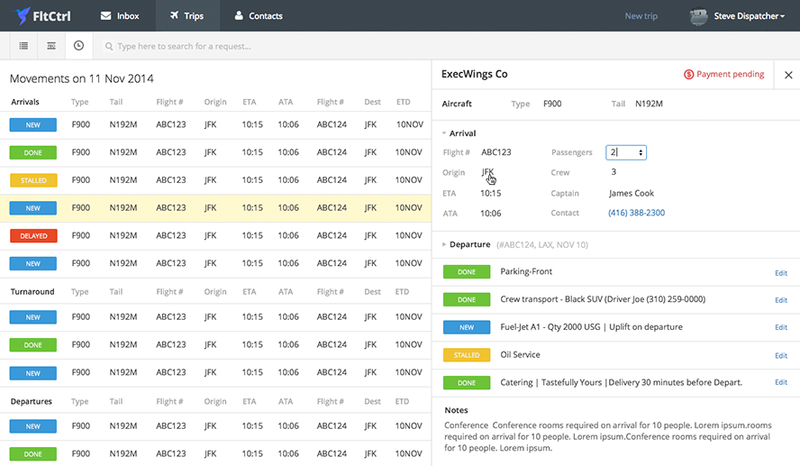 Create and follow up on an unlimited number of flights effortlessly. 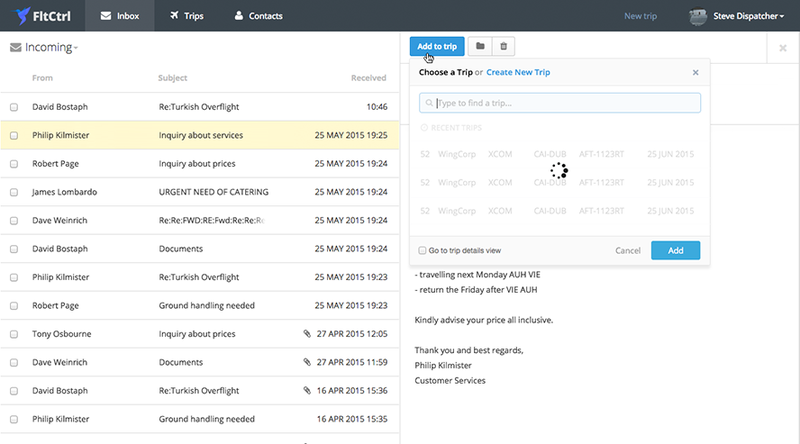 With FltCtrl, you get to stay organized and operate your flights without all the clutter. FltCtrl will help you track all your team performance and provide them with feedback when needed. Contact us to schedule a demo and see how FltCtrl can save or make more money for your business.